Korean media is reporting this morning that LG and Samsung are sampling sapphire for mobile cover displays. Currently the leading sapphire growth and equipment manufacturer GT Advanced Technologies is operating the largest sapphire manufacturing facility in the world on behalf of Apple. 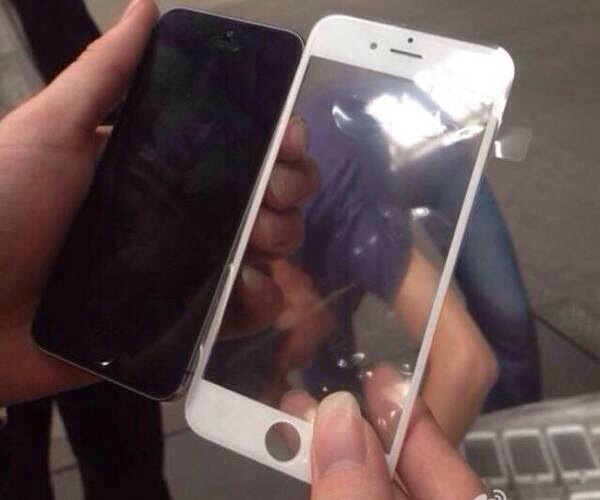 Apple is expected to add sapphire cover displays to its highly anticipated iPhone 6 mobile phone later this year. The biggest knock on sapphire cover screens has been price and availability but perhaps one of both of these factors is about to change. Full Disclosure I am long GTAT and I have joined PTT Research. My premium Forensics Newsletter is scheduled to launch on June 2nd. The premium paid service option will grant my paid subscribers exclusive content weeks before my analysis is published on Seeking Alpha, the Obscure Analyst blog or any other website. Another advantage of PTT is the subscriber Forum that allows sharing of ideas and analyst Q&A. Did you know, that subscription based investment newsletter are typically tax-deductible? GT Advanced Technologies (GTAT) is making a structural change at the head of its finance division by recruiting a CAO. The move signals the end of the dual title of CFO/CAO that has persisted over the last several years. GT named Raja Bal as Chief Accounting Officer (CAO) and “successor” CFO on January 16th, 2014. Raja Bal succeeded Richard Gaynor as GT’s CFO on March 7th, 2014. GT is currently in the process of transforming its business and becoming a “high growth, multi-national/global, diversified high technology manufacturing company”. The ideal candidate will have a minimum of 5 years’ experience as a CAO / Corporate Controller with 15-plus years of progressive financial management experience with publicly traded, high growth, multi-national/global, diversified high technology manufacturing companies. Provide leadership and oversight of all aspects of the controllership and accounting functions of the organization including payroll, accounts payable, billings and receivables, internal audits, external audits, and SOX requirements. Be responsible for timely and accurate dissemination of financial reports and leadership highlighting major issues and trends and commentary on variances from plan, prior year and forecast. Expertise in issues specific to high volume manufacturing environments including cost accounting, factory cost pools, standard cost, variance analysis and overhead absorption. Demonstrated ability to drive product cost reduction and operating expense rationalization initiatives. Manage quarterly and annual reporting including the completion of financial statements and footnotes, management’s discussion and analysis encompassing review of all new accounting matters, application of judgment, and significant matters for discussion with disclosure committee. Impeccable integrity; words and actions must continually reinforce this characteristic. Support the selection, negotiation and due diligence processes for acquisition targets. Oversee and coordinate the financial and accounting diligence efforts and integration process. Manage consolidation of accounting and reporting requirements for acquisitions. Exceptional communication skills; experienced and effective in interacting with senior executives and line management at all levels. Credible, persuasive and clear in both oral and written presentations. Effective interpersonal skills; must be able to relate to and work cross-functionally with a wide variety of professionals across different cultures. A certain level of travel will be required to GT’s locations domestically and in Asia. Last week GT Advanced confirmed the company’s guidance of $600-800m for 2014 and management could not provide a breakdown as to when or what way Apple could use sapphire. GT did confirm on the conference call that all of the sapphire being produced will be utilized. I’ve been asked by various investors and followers whether or not the iWatch alone is large enough to hit GT’s guidance of $600-800m of revenue in 2014. My simple answer is no. I’m estimating an ASP of $4 for each sapphire iWatch screen and even if Apple’s iWatch sales exceed 60m in 2014 it would only amount to $240m of revenue for GT. The Apple/GT Mesa, AZ sapphire plant measures over 1.3 million square feet and I have read some reports that Apple would be dedicating this facility to produce sapphire home buttons and iWatch sapphire covers. GT announced recently that its 165 kg boule sapphire growth furnace was going to be commercially ready in Q3’14. Additionally, GT also announced that they have sapphire growth furnaces that are producing “significantly” larger sapphire boules than 165 kg. These larger ASF sapphire growth furnaces were being held captive for the company’s internal use but they are production ready and are likely in operation in Salem, MA and Mesa, AZ. There are a lot of factors that go into calculating the screen yield per ASF furnace and the difficult part is that the factual information is not readily available from the two parties involved. What facts I do know can help everyone understand just how extraordinarily the amount of sapphire that will produced inside the Mesa, AZ sapphire plant will be once it reaches full capacity. I modeled out the iWatch at 1.5″ by 1.5″ which actually equates to a 2.25″ screen size which is significantly larger than sub 2″ screen estimates I have seen from various analysts. The sapphire screen thickness for my calculations is 0.60mm which is just 0.05mm thicker than the current thinnest version of gorilla glass. The boule size for my calculations was 200kg and 230kg, based on my conversations with a leading sapphire expert and commentary I’ve seen by GT regarding the company’s planned larger boule size. Additionally, I’ve modeled out the days to grow a boule at 17 days and 22 days, currently GT specifications on the ASF115 are “18 days or less”. I did reach out to GTAT for clarification on the specifications of the ASF165 and the company representative declined to comment. Lastly, I’m estimating that 20% of the sapphire boule will be lost due to kerf loss and/or any other defects. Based on my calculations, 1 ASF furnace can produce between 800,000 and 1.1 million, 2.25″ screens that are 0.6mm thick iWatch sapphire cover screens each year. If Apple sells 60m iWatch units in 2014 it would require between 55 and 75 ASF growth furnaces running 12 months of the year to produce enough sapphire to cover 60m iWatches with sapphire. Keep in mind that the Mesa, AZ sapphire plant is expected to house 1500 to 2000+ furnaces. A fully ramped up Mesa, AZ sapphire plant would be able to cover 1.2 billion and 2.2 billion 2.25″ iWatches a year with 1500 to 2000 furnaces running year round Additionally, if you believe that the Mesa sapphire plant is just for home buttons, you should realize that the plant would be able to produce at least 10 and 20 billion sapphire home buttons a year once at full capacity. The Mesa, AZ sapphire plant owned by Apple and operated by GT Advanced Technologies will produce an extraordinary amount of sapphire. I can assure you that home buttons and iWatch covers will not make a small dent in the amount of sapphire that will be produced annually within the 1.3 million square foot facility in Mesa, AZ. GT recently commented during the company’s Q1 2014 conference call that Apple will utilize all of the sapphire being produced. 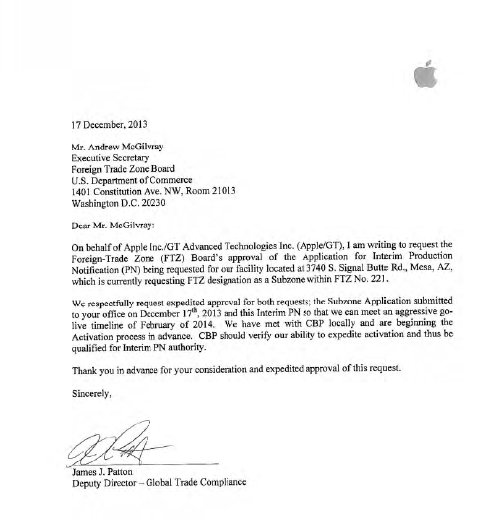 GTAT and Apple have not commented, confirmed or answered any questions directly related to the use of sapphire in Apple’s products, but a savvy investor would sit back and realize its going to take hundreds of millions of Apple devices sold annually to consume the extraordinary amount of sapphire that will be produced inside of Mesa, AZ. I can tell you that we are producing sapphire, and that I expect that the sapphire we produce will be fully utilized. #1 GT will raise 2014 FY guidance to $800m to $1B from $600m to $800m driven by sapphire and equipment sales. 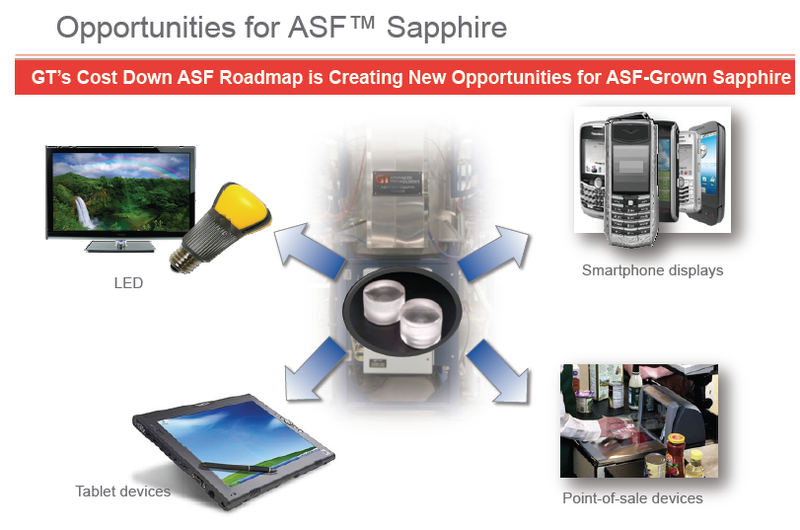 GT will not break down the revenue contribution between ASF equipment and sapphire material sales. #2 GT will announce another significant PV win in the Middle East. PV Tech’s Mark Osborne has been tracking a large PV project in the Middle East that was expected to decided before the end of 2013. To the best of my knowledge this project is still on the table and GT is in position to win this bid. #3 GT will announce new applications for Hyperion related to solar cells as a result of GT’s develop work with a “well-known” solar cell manufacturer in Asia. #4 The first high volume sapphire covered phone will be sold. Although, I believe the iPhone 6 could be announced as early as June there is nothing preventing Apple from launching whenever they feel like it. 90 days from May 7 gives me until August 7th for the first high volume sapphire covered phone to be sold. #5 GT will announce its first PO for Hyperion, likely headed to the Medical or Military. #6 GT will announce the first Merlin order (towards the end of my 90 day view). #7 GT will announce further progress and the commercialization of its composite glass that can be bonded with sapphire lamina. #8 GT will announce its first “total solutions” order related to Hyperion coupled with ASF furnace and bonding equipment or coupled with a Silicon Carbide furnace and bonding equipment. 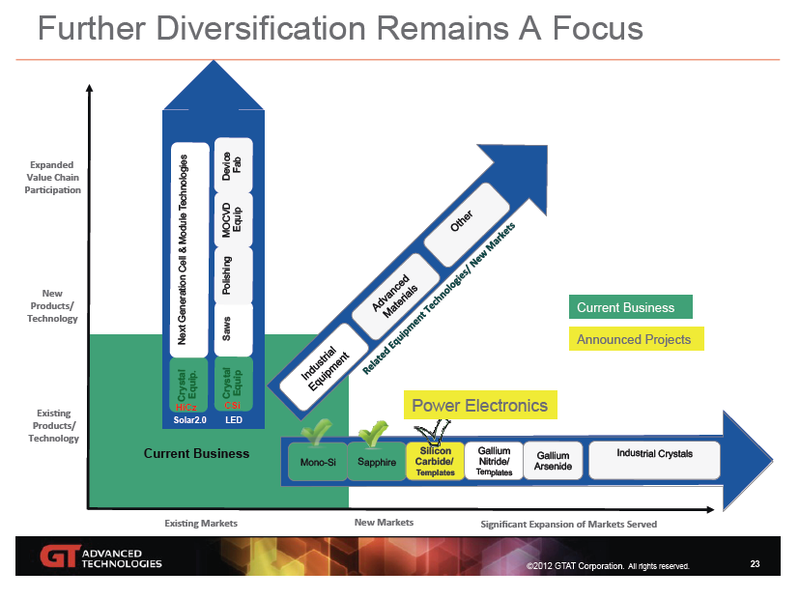 Below is GT’s 2012 Diversification Road Map. I would appreciate it if GT provided an updated version to help guide me towards the company’s 2017 and 2018 goals. As you can see from the chart below on the left hand side above current business, GT has delivered Merlin for module technologies but is still holding out on the solar cell technologies. It makes complete sense to couple GT’s solar cells and Merlin module technologies together to deliver a charge to the solar industry. I’ve been asked by a few people what is going on inside GT’s San Jose office? As it turns San Jose is currently the location that is designing and building the Merlin pilot line along with the building of high volume production machines. 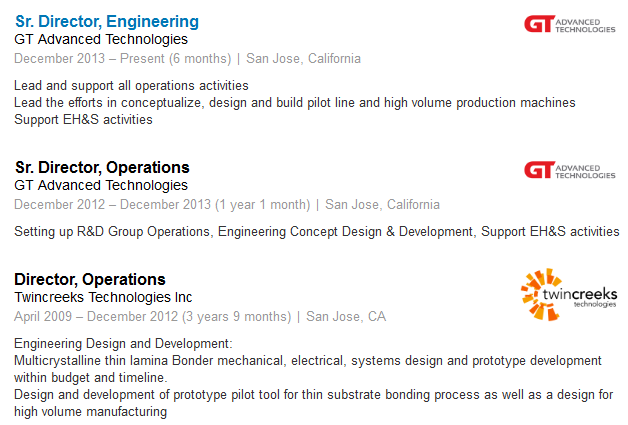 According to a few employee profiles on Linkedin, GT has been on designing and building the Merlin pilot since late 2013. GT indicated in March that the company planned to have the Merlin Pilot line operational and engage early customers in the 2H’13 and commercially ready by 2015. I have no update against GT’s expected date but it does look the Merlin operation is up and running. If you paid close attention a week ago to my Merrimack plant expansion and renovation news, you would be in my camp that we knew some sort of deal was coming. I fully expect the expansion in Merrimack will be outfitting the manufacturing operations announced in today’s press release. For full disclosure, I was kind enough to share Merrimack expansion news with a NH Business Review and they followed up with GTAT, asked some questions and put out a report. Additionally, I took my efforts to Seeking Alpha to further expand the reach of the news. I don’t believe GT was expecting someone to report on its planned and approved expansion before GT had a chance to “formally” announce its plans to the public. Investors should be expecting GT’s management to touch upon both topics (Merrimack and today’s announcement) next week during the Q1 2014 conference call. The biggest question I think everyone has is what is the size of the announcement and when will revenue hit? GT’s CEO has already informed investors that he doesn’t build a mouse trap and wait for the mice. Instead he works with the customers and gives them what they want. GT put together a comprehensive expansion plan in just a few weeks for their Merrimack location. GT was granted approval on April 1st and they want this project completed in 6 months or less. Reading between the lines and thinking outside the box (still haven’t found the box) I believe we could see some contribution of revenue in Q4 of 2014 in the neighborhood of $25 to $75m. The key to sizing up today’s news is understanding the target markets along with the new products and adoption of those products that will occur. If GT can sell the entire package of furnaces, Hyperion and bonding equipment to each interested party the value of today’s press release may add $500m or more in revenue to GT’s top line as soon as 2015. GT would not shutter all or some of their R&D operations unless their was a significant slice of pie to be had. I am very curious for an update on GT’s expected Hyperion market adoption rate. GT is now selling a complete solution (growth, exfoliate and bond) versus just the selling the furnaces to grow materials. The company has entered into a memorandum of understanding (“MOU”) with European-based EV Group (“EVG”), a global leader in specialty bonding and material handling equipment, to work together in various collaborative arrangements including jointly developing high volume production processes and equipment necessary to bond the ultra-thin sapphire and SiC lamina, produced by GT’s Hyperion™ technology, to engineered substrates such as glass, silicon, and plastics. GT’s business model will be focused on selling the bonding and coating equipment developed through these initiatives. The announcement today regarding GT’s strategic initiatives surrounding Hyperion Lamina Production Technology was partially on my radar. From reading previous conference call transcripts (see GT’s management comments at bottom) I knew GT was working on composite glass, however I had no idea they would enter the bonding market. GT’s entry into the bonding market makes complete sense, if you think about how GT focuses on the entire product life cycle, from birth to end product. GT’s announcement today allows them to own three significant processes within this entirely new product life cycle; material growth, exfoliating material in lamina and bonding the lamina onto various substrates (surfaces) including glass, plastics and silicon. GT may produce composite material or sell equipment to produce composite glass, however this one item it still very unclear based on the press release. #4 Selling Composite Glass Equipment or Producing Composite Glass? – This one seems a little ambiguous but it looks like GT is partnering with a glass substrate maker to produce composite glass. My open question is whether GT will produce or sell the equipment that will produce this new material. GT’s announcement today and focus is broken into 3 product segments, Sapphire and Sic on glass, plastics and silicon. Sapphire laminate on composite glass and Aluminum Oxide Coating. GT announced it will begin working with a leading glass substrate producer to develop specially engineered substrate materials that can be bonded to ultra-thin sapphire lamina to create unique composite solutions that expand the reach of sapphire into a broader set of applications. In addition, we believe that, over time, our Hyperion solution, currently in the R&D phase, could enable further cost reductions that could bring sapphire solutions to cost parity with strengthened glass, further broadening the array of applications and actually increasing the demand for sapphire. Our early progress gives us added confidence that Hyperion will achieve these milestones. Well, I think there’s no gigantic bump in R&D for us to complete development of the project. I mean, we’ve moved around and prioritized our R&D spending accordingly. Hyperion is not a first-generation product. Hyperion is a follow-on second- and potentially third-generation product. And it won’t be the same as pure sapphire. There’s pure sapphire and then there will be these composite structures that will come out. And so we think it’s significant, but we don’t believe it will have an impact on first-generation adoption. It’s more of how does the — how do these applications unfold later. And Hyperion is — it is a tool that can be used with sapphire. But we’re just as excited, if not more excited about the applications of silicon carbide and silicon and other monocrystalline materials where, for example, silicon carbide wafer today and epi-ready wafer cost $800 to $900. We believe that we could substantially change that equation if we’re successful with silicon carbide lamina. So very exciting opportunities outside of sapphire, again, but not a short-term implication to it in the market. In support of the new materials business, we have accelerated the development of our next-generation launch capacity, low-cost ASF furnaces. Not only will these efforts support our initiative with Apple, we expect that it will enable the expansion of our LED, industrial and specialty sapphire businesses, positioning GT and its equipment customers as the industry’s lowest-cost sapphire producers. We’re very excited about the opportunities that lie ahead for our sapphire business. As strong as our sapphire opportunities maybe, the GT story is not just about our emerging sapphire business. In fact, our entry into the sapphire materials business may enable us to expand into other material segments whilst (sp?) we have fully ramped the operation in Arizona. Full Disclosure: I am long GTAT and plan on using the money generated from this blog to buy additional shares of GTAT! 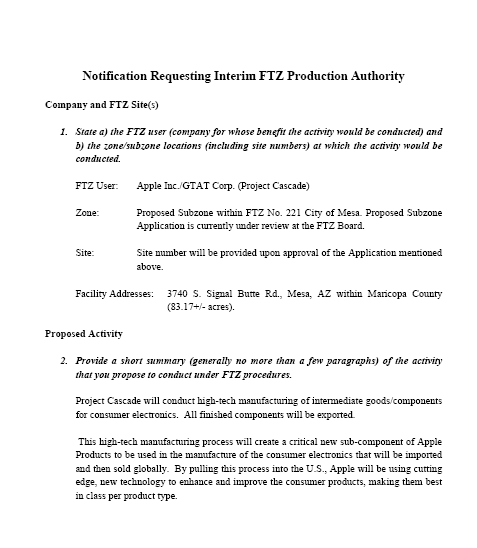 Apple submitted two applications to the Foreign Trade Zone (FTZ) No. 221 for approval. 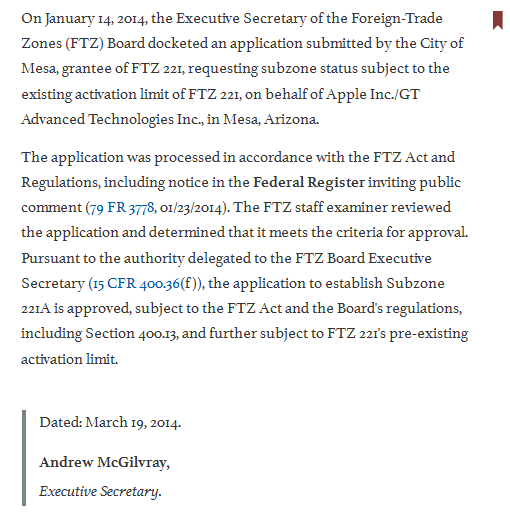 Apple’s application for Sub Zone designation at the Apple/GT facility was submitted to the FTZ office on December 17th, 2013 and Apple’s application for “Interim” Production Notification Application was submitted to the FTZ office on December 30th, 2013. The Interim Production Notification Application indicated that Apple had an aggressive go-live timeline of February 2014. 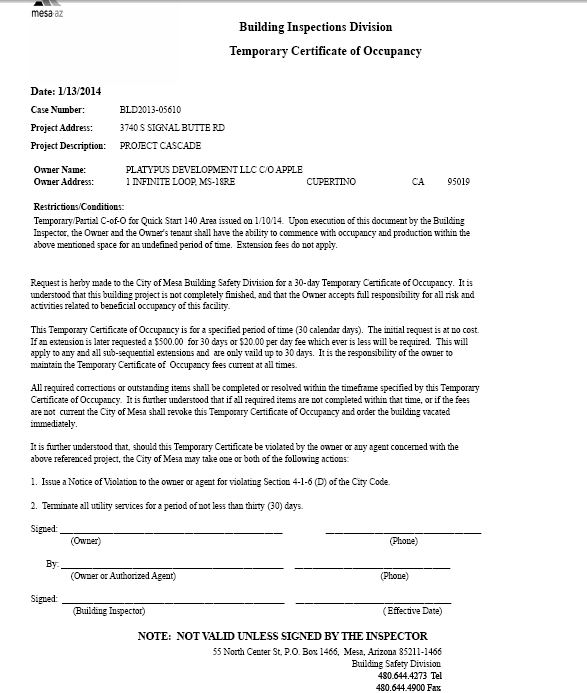 The Apple/GT facility was granted a temporary C-of-O (Certificate of Occupancy) to commence with occupancy and production of Quick Start 140 area on January 10th, 2014. Quick start 140 was located in Module 1 of the Mesa facility and contained 140 “tools,” which are also know as sapphire growth furnaces. 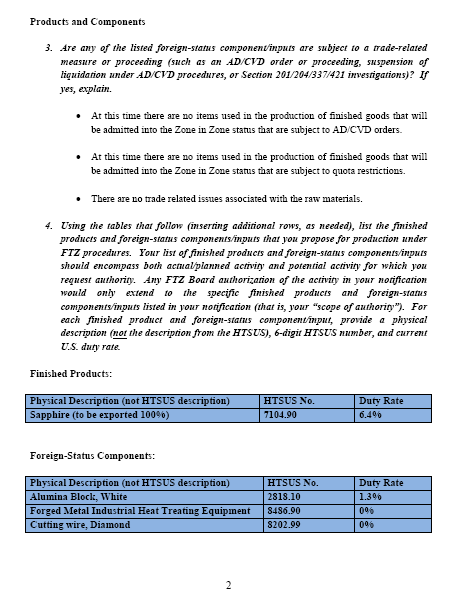 Apple’s application for Sub Zone 221 designation was submitted to the FTZ office on December 17th, 2013. 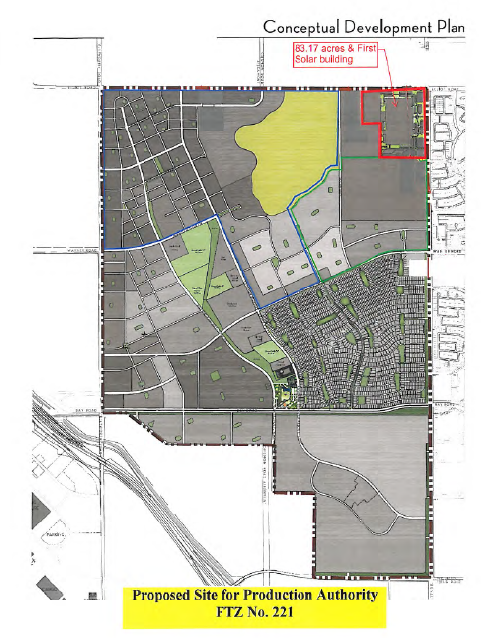 The Apple/GT facility was formally granted Sub Zone approval on March 19th, 2014. The Sub Zone approval was the final step required before Apple and GT could begin in earnest to manufacture intermediate components for consumer electronics for exports as indicated in their original Sub Zone application. Another interesting fact to point out is the Master Development and SOW agreement between Apple and GTAT is that the agreement requires any additional furnace purchases, would be negotiated in good faith prior to the second Milestone Payment made under the Prepayment Agreement. GT reported during their Q4 2013 conference call on February 24th, 2014 that they had received the second Milestone Payment from Apple. The receipt of the second Milestone Payment from Apple signals that the furnaces that were required to be purchased and deployed as part of this agreement were all ordered on or before February 24th, 2014. According to Port Authority records, sapphire growth furnace deliveries began heading to Mesa, AZ on December 2nd, 2013 and the last known delivery was recorded on March 10th, 2014. I have tracked 1,265 furnace deliveries that have passed through Port Authority. Additionally, any and all domestic furnaces that did not pass through Port Authority (i.e. truck) would not be caught in my sapphire furnace fishing net. I have assumed GT deployed $251m of PPE ($180m) and Inventory ($71m), which would account for 837 additional furnaces inside Mesa giving me a total confirmed/estimated of 2,102 furnaces. The book cost that GT assigned to each furnace that was deployed and taken out of inventory could be substantially lower than $300,000 per furnace. If, GTAT’s price per furnace is actually $30,000 lower than my estimate it would add almost 100 furnaces to my estimate, conversely a $30,000 increase would decrease my estimate by 100 furnaces. Based on my correspondence with a sapphire industry expert, GT had previously touted their ability to ramp up 500 furnaces per month at ASF equipment customer locations. However, GT has already informed investors that they dedicated a vast majority of their ASF capacity to the Mesa, AZ sapphire effort, which would likely drive their drive GT’s maximum furnace ramp north of 500 furnaces per month. 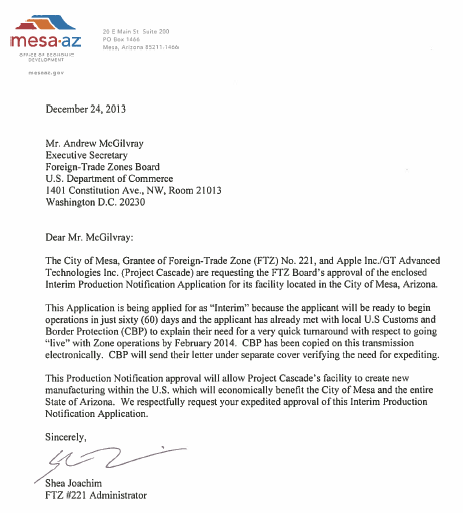 Based on the furnace delivery dates and GT’s touted ability to ramp up efforts and focus on Mesa I’m becoming hard pressed NOT to believe that the Apple’s Mesa Sapphire plant WAS likely operating at or near full capacity just days after the receiving the official unlimited go-live approval from the FTZ on March 19th, 2014. If I was to develop a game changing technology with a PV module maker I would not only want to the biggest fish but I would want someone I trust. Someone that I have worked with years! As it turns out Yingli Green Energy not only was ranked #1 for producing solar cells but their relationship with GT Advanced Technologies (formerly GT Solar) goes back to 2002, when Yingli became GT’s first customer in China. 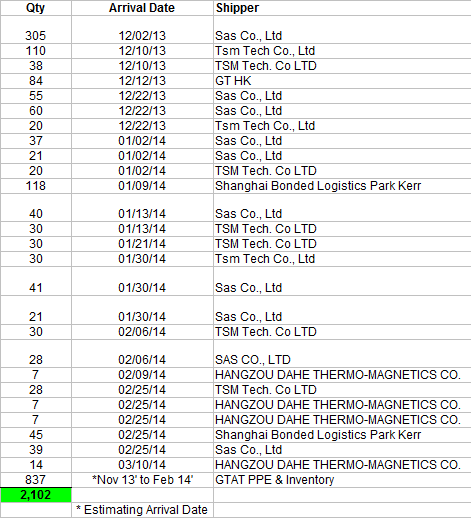 Also, if you look at the various orders placed over time by Yingli the press releases contain language that translates to “hey scratch my back and I’ll scratch your back.” If you don’t believe me, read these comments between GT and Yingli’s within this order announcement from 2010 to that is focused on celebrating GT Solar’s 1000th DSS450 Crystalline Ingot Growth Furnace shipment as well as the very close relationship between the companies. GT Solar International, Inc. (NASDAQ: SOLR), a leading global provider of polysilicon production technology, crystalline ingot growth systems and related PV manufacturing services for the solar industry, today announced that it has achieved the milestone shipment of its 1,000th DSS450TM crystalline ingot growth furnace. The recipient of the system is long-time Chinese customer Yingli Green Energy Holding Company Limited. “We are pleased that Yingli continues to express confidence in our ingot growth technology,” said Tom Gutierrez, president and chief executive officer of GT Solar. Yingli Green Energy became GT Solar’s first customer in China in 2002 when they set up the first ingot, wafer and cell production lines at their Baoding headquarters. These production lines launched Yingli into the PV manufacturing industry and today they are one of the world’s leading fully vertically integrated PV manufacturers. Yingli has continued to invest in GT Solar’s multicrystalline ingot growth furnaces including the DSS240, which was introduced in 2003, and the current DSS450, which was introduced in 2007. Today, GT Solar has shipped over 1300 crystalline growth furnaces to customers around the world. It’s very clear that Yingli and GT have a mutually beneficial relationship and both have admiration and appreciation of the benefits that have resulted from their long partnership. GT has enabled Yingli to continue to be a leader in the PV module space while Yingli’s investment in GT equipment has allowed GT to expand their business and invest money in their R&D to support the next generation of equipment that will benefit Yingli even more. 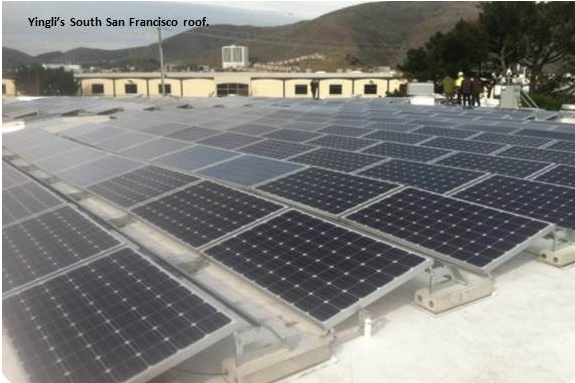 Yingli announced on July 12, 2011 that they were opening up a R&D facility in the San Francisco Bay Area for comprehensive product testing and evaluation. Furthermore, the announcement indicates that the new research and development lab will accelerate our understanding of module performance and reliability. Additionally, R&D facility lab will allow them to evaluate new technologies and deliver next generation products. 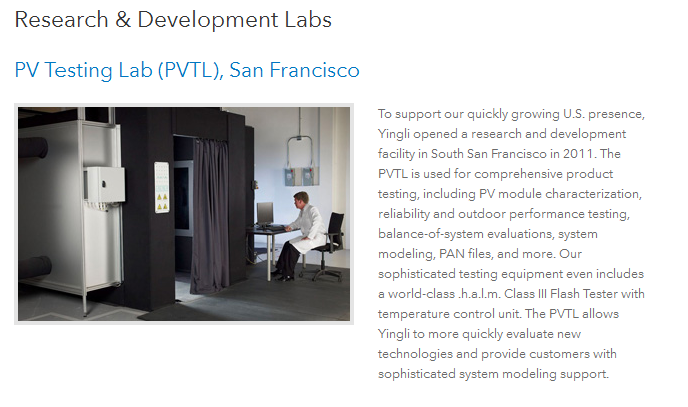 Yingli Americas also announces the opening of a new research and development facility in South San Francisco for comprehensive product testing and evaluation. Yingli is very interested in reducing the cost of PV modules evidenced by their strategic agreement with Dupont that was signed in February 2012 for $100 million. Yingli reupped on the contract and extended it another year for an additional $100m last June. Under the terms of the terms of the agreement, Yingli China will purchase materials including DuPont™ Solamet® photovoltaic metallization pastes that help boost the power output of solar cells and DuPont™ Tedlar® polyvinyl fluoride film that has been proven to protect solar panels even in the harshest environmental conditions. I have some bad news to report for Dupont, the silver paste sales to Yingli may shrink up to 80% from the previous levels. 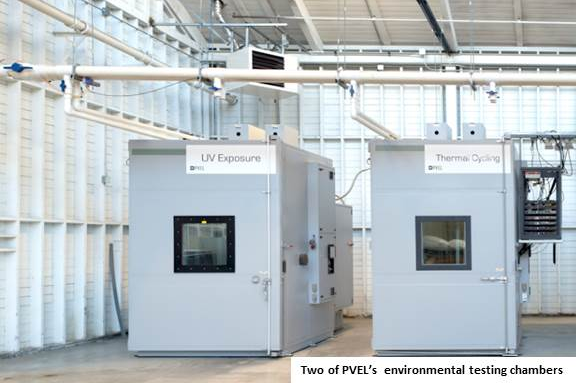 PV expert Mark Osborne, from PVTech summarizes this one very simply, “GT Advanced Technologies has launched a c-Si solar cell metallisation and interconnect technology that it claims will boost conversion efficiencies while lowering production costs via significantly reduced silver paste consumption”. In another article about Merlin, Osborne points out that “GTAT ‘Merlin’ metallisation and interconnect technology reduces silver paste needs by 80%“. It appears that one of the biggest losers from Merlin’s entry into the PV module world will be Dupont, who will likely see most, if not all of their $100 million materials contract centered on silver paste evaporate and shift over to GTAT before the summer is up. GT mentioned that Merlin came out of a research operation that was established over a year ago. I was able to retrieve a copy of GTAT’s Investing in Continued Growth and Diversification presentation, that was discussed in August 2012 during Canaccord Genuity Growth Conference. What is interesting on this presentation is that GTAT actually spills the beans that they “are considering opportunities to move downstream solar equipment market to support next generation solar cell and module manufacturing.” As it turns out it took GT less than 2 years to mention an opportunity and to bring it to the market. This is exactly the same broadcasting GT has been doing over the last 2 years with sapphire cover screens. It will come as no surprise to the long-term GT followers when Apple releases sapphire cover screens across their upcoming iPhone 6 line-up. When GT’s management says they are confident and all that is left is execution, the message is clear, they are going to get it done! 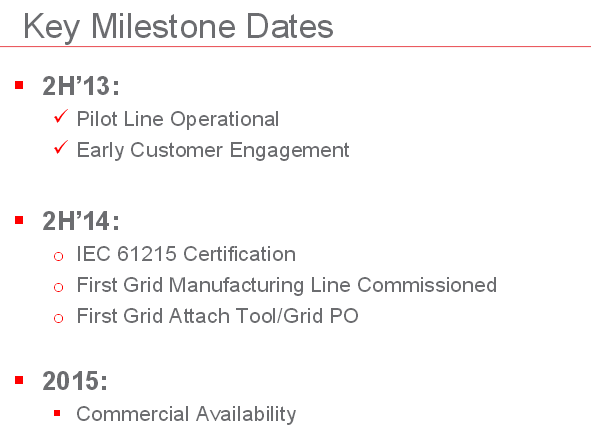 Merlin technology is “discussed” in the second bullet point on the image below from the August 2012 conference presentation. If you are wondering what else GT brought up during the August 2012 conference especially relating to sapphire cover screens, please see the image is below. BTW does Apple make LCD TV’s? 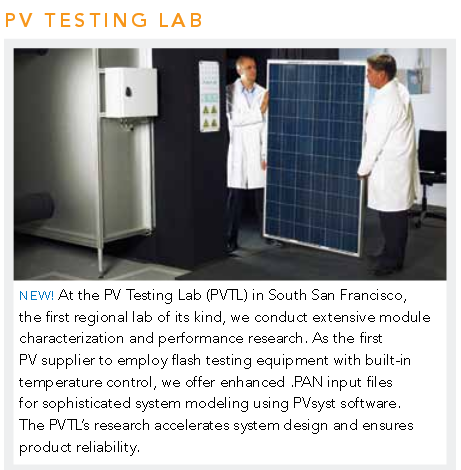 Clearly GT’s Merlin PV module technology fits like a “T” within Yingli’s PV Testing Lab’s primary focus area and the facility is located in the Bay Area and it was established more than a year ago. The contract announcement in 2010 between GT Solar (renamed to GT Advanced Technologies) clearly exhibits the GT co-dependencies, trust as well as a high level of engagement between both companies. 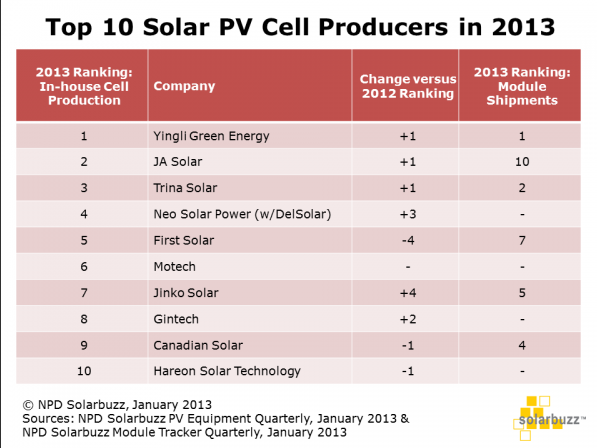 Additionally, Yingli has been ranked near the top of the PV Solar Cell Producing charts for the last several years and they are well positioned in the solar industry to keep growing the top line and improve their bottom line with the help of GT’s Merlin Technology. I don’t know about you but I think Yingli was the “secret” partner that helped GT perfect the Merlin technology and I fully expect Yingli to be the first customer of GT’s Merlin Technology. Furthermore, I’m expecting Yingli and GTAT to once again celebrate their long tenured relationship and continued partnership within Merlin’s inaugural order announcement before the end of this summer. 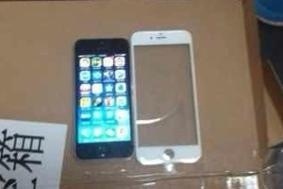 As the iPhone 6 inches closer to its release date the volume of leaked photos will continue to rise. The latest edition of leaked photos from Weibo.com appear to show the front panel of the upcoming iPhone without a cover screen. The front panel appears to be longer and slightly wider than the iPhone 5 that is pictured next to it. The leaked images align closely with news reports that various suppliers will begin ramping up production of various key components in Q2. If components are coming off the production press by late May then a late June release for the 4.7″ cannot be ruled out. Foxconn reportedly was producing 500k iPhone 5s models a day by late 2013 and I expect the addition of Pegatron to lift total capacity closer to 1 million phones per day. In March it was reported that Pegatron was going on a hiring spree to be ready to assemble units during Q2. The iPhone 6 manufactures could conceivable produce enough units of inventory to in just 30 days to support a iPhone 6 launch in late June or early July. Stay tuned as this could be a surprise to everyone. Taiwan Semiconductor Manufacturing Company (TSMC) reported began production on the A8 chip in March. Micron Technology announced that they begun ramping up production of their DRAM memory LPDDR4 which is also consistent with company comments made in January that they would land in mobile handsets later in 2014. Reuters indicated that Japan Display Inc, Sharp Corp and South Korea’s LG Display Co Ltd will begin mass producing display touch panel screens as early as May. Sapphire cover screen supplier GT Advanced Technologies, who is growing sapphire inside Apple’s Mesa, AZ sapphire plant has also begun to ramp up its production as well. 9to5Mac released information in January indicating that Apple wanted to go-live with the Mesa sapphire operations by February. 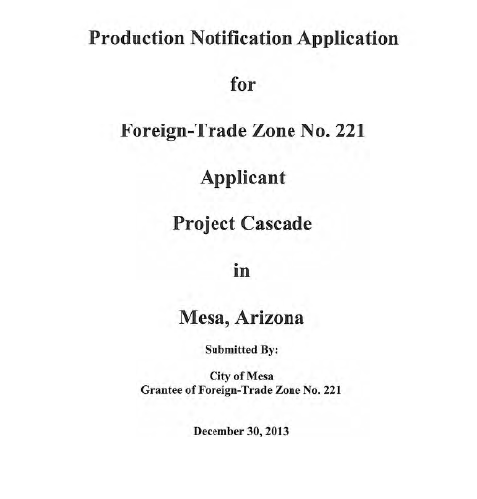 Additional records pulled from the city of Mesa website and FTZ indicate that the facility has indeed begun production and the first line or 140 tools (ASF sapphire growth furnaces) went live on January 10th and was followed by another significant ramp up in Tools by the middle of February.